It seemed simple enough in the beginning. The farm has hayfields which have been cared for very well over the years, and are a healthy mix of Timothy grasses, clover, and alfalfa – with a smattering of cowpea mixed in for good measure. Conceivably we could take three cuts if the weather conditions favour us this year. Our idea was to get into a calf/cow operation and keep a small herd of cows. However, we are beginning to wonder if haying our own land makes economic sense. A cattle farmer pointed out to us that depending on the type of operation we foray in to (calf cow, stocker, yearlings etc.) it may put more dollars in our pocket to buy hay. Initially, I objected to the idea. 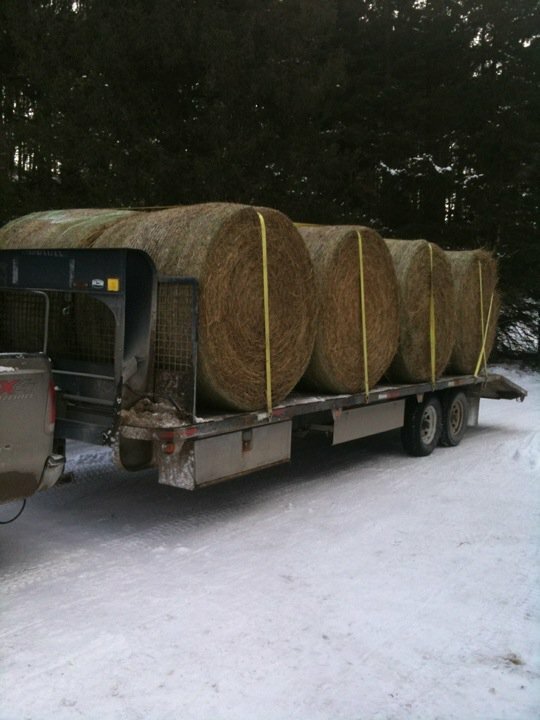 Buy hay?!!! Why would I buy hay when I could grow my own and with a little sweat equity fill my barn for the winter? However, as time went on, I began to explore this interesting idea. Perhaps a calf cow operation with a hay crop is not the best option for small farmers. We have a 50 acre holding, with about 28 acres in hay and 12 acres in pasture. (The rest is a mix of residential area and hardwood forest). Our 28 acres of hay, with 3 cuts, may give us 60-80 five foot rounds. If we have a calf/cow operation a 1300 lb. dry pregnant cow in good condition needs to eat about 27 lbs. of hay per day to maintain her and grow her calf during the winter months. (But accounting for “spillage” or wasted hay, that figure becomes more like 35-40lbs per day.) For a small herd of 5-6 cattle, one round bale per day and a half is a good estimate. This means that we would have about 4 months of hay from our own fields, and we would then have to buy hay to make it through the remaining 3 months. This scenario works if several factors are true. 3) That we have some sort of structure to store round bales in. This would require buying a coverall building of some sort. Each option creates money in the bank for the farm, and it’s important to think about all aspects that will impact your return on investment. (Will grain be required for cattle? Veterinary costs? Fencing requirements? ) Market values for cattle need to be measured against the expected outcome, and in the end a the most profitable solution will emerge. It’s kind of appealing to think of going with scenario two…as it would mean less work in the summer months and far less work in the winter months.